More than five million barefooted people joined a parade of a centuries-old icon of Jesus through Manila, the capital of the Catholic-majority nation of Philippines, on Friday ahead of Pope Francis's visit. At least two died and 1,000 were hurt during the event. 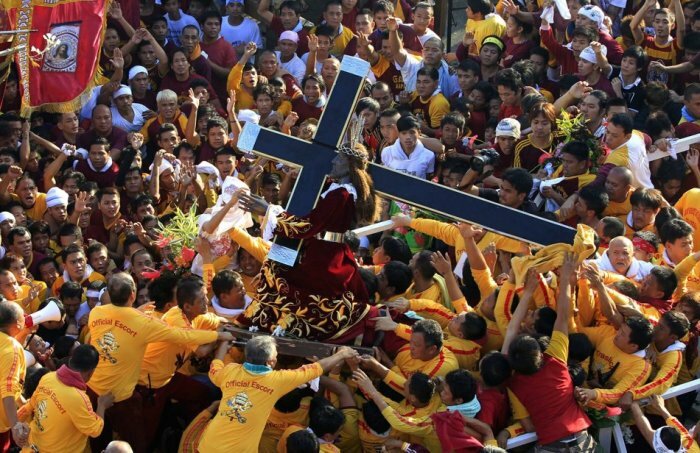 There were about five million Catholic devotees trying to get a chance to touch the Black Nazarene statue of Jesus, which they believe can deliver miracles, including healing, according to Agence France Presse. During the parade, at least two men died and about 1,000 others got injured, according to The Associated Press. About 5,000 police were deployed, with 1,000 military personnel on standby, for security. While a volunteer accompanying the statue died of a heart attack, another man was found dead on the ground at the end of procession early Saturday, Francis Tolentino, chairman of the Metropolitan Manila Development Authority, was quoted as saying. Besides, about 1,000 people received cuts and bruises or complained of dizziness and hypertension, according to Gwen Pang, secretary general of the Philippine Red Cross. "The Lord is my healer," Lina Javal, a 58-year devotee who recently underwent a throat surgery, was quoted as saying. "It's an extraordinary feeling, it's like the Holy Spirit is entering my body," another devotee was quoted as saying. "The brand of religious devotion that we see in Filipino Catholicism is based on a very strong desire of the majority of our people for a more immediate and direct access to divine help or power," Manuel Victor Sapitula, a sociology professor at the University of the Philippines, was quoted as saying. Pope Francis is scheduled to visit the Southeast Asian nation from Jan. 15 to 19. According to President Benigno Aquino III, as many as 6 million people are likely to visit Manila during the pope's visit. Authorities plan to deploy 25,000 police and soldiers for security. "But with 25,000 against 6 million, the government cannot do it alone," Aquino was quoted as saying. "So we want to repeat this message: with cooperation from the church and various groups and the private sector, we will be able to achieve our goal of a peaceful and meaningful visit by the pope."